I have been a volunteer for you guys in the past so I am a little partial and invested but even so we are still so grateful for you guys. On Feb 28, we had to very unexpectedly lose to cancer our female Chihuahua mix who was a shelter rescue in 2006. Her name was Zoey and she was very much the dominant one in our family pack. Our grief is still heavy and will always be there but we knew a piece to our puzzle was missing. Our 7 year old male boxer, Boscoe, was also missing his companion. As I completely understand everyone’s readiness to accept a new pet after such a loss, we knew we were ready, as a family. Of course one of the first places I checked was ABR and there she was….Baltia! 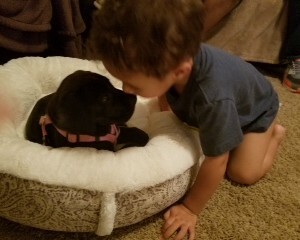 We instantly became in love and just had to have her. With great excitement we waited to hear that we had a chance to meet and see if she was truly a fit for us. 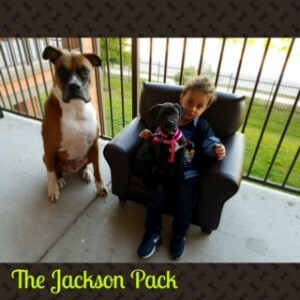 Instantly, our Boxer Boscoe began protecting her and our two year old son instantly had a shadow. I had asked my toddler son what her name was based on a picture I showed him before he met her in person. He said a name what sounded like “May-zee”. 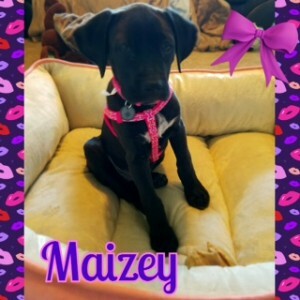 Therefore, we have now proclaimed her name to be Maizey. That spelling will always be special to us because she was share that crazy “Z” with our special Zoey. Maizey is everything Boxer and could not have asked for a more precious little princess! We can’t wait to grow old together, go on adventures, and make lasting memories for all of us. She is officially a part of The Jackson Pack! !